Boeing beat out an offering from Textron [TXT] for the award, which has a one-year base period and seven option years. The first deployments of Insitu’s ScanEagle sUAS are scheduled to be ready during the second quarter of fiscal year 2019 aboard the 418-foot cutters James and Stratton. Insitu will provide about 200 hours of sUAS service per 30-day operational patrol period on every cutter equipped with its ScanEagle systems. A Coast Guard spokeswoman told Defense Daily on Thursday that an NSC typically spends 185 days on patrol each year. Under the contract, Insitu will supply its ScanEagle sUAS system, which will include pilots and logistics support, launcher and recovery systems. The ScanEagles will be equipped with an EO900 electro-optic imager, mid-wave infrared 3.5 camera, Australia’s Sentient Vision Systems’ ViDAR optical radar, communications relay, laser marker, and automatic identification system, an Insitu spokeswoman told Defense Daily. Coast Guard requirements call for the sUAS systems to be able to remain aloft for at least 12 straight hours to conduct surveillance and reconnaissance missions. 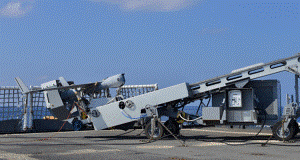 The service previously used the ScanEagle on three separate deployments aboard the Stratton to help develop requirements and operating concepts for procurement and deployment of sUAS systems. The earlier evaluations included use for drug interdiction, search and rescue missions, and living marine resources missions. Former Coast Guard Commandant Adm. Paul Zukunft said previously that initially there were some reservations by the ship commanders about adding another system to their vessel but that the sUAS allowed them to alter their tactics for interdicting drug smuggling vessels at sea and improve the chances of capture before they could dump their illicit cargos. In the 700-plus flight hours of the ScanEagle aboard the Stratton during the requirements evaluation, the sUAS was involved in 17 drug interdictions, the Coast Guard said. “The sUAS has already proven itself to be a transformational technology on the technology employment, and the deployment of this capability to the entirety of the NSC fleet is an incredibly important first step in realizing the Coast Guard’s vision of fleet-wide UAS implementation,” Cmdr. Daniel Broadhurst, who served as Unmanned Aircraft Systems Division Chief in the Office of Aviation Forces, said in a statement. The Coast Guard’s plans call for equipping its NSC fleet at a rate of about two vessels per year. The service is budgeted for 11 ships and Congress may fund one more. The Navy already uses a contractor owned and operated model for equipping some of its surface vessels with sUAS systems, which have accumulated more than 700,000 flight hours to date.